I'd be up for some pencils. I've never done HB, but it sounds like fun! Well i dont think there nees to be a specific time frame. I want to get started on my opening part asap, but the holidays obviously factor in. That last group projects took 3-4 months from beggining to end. An end date is always good. A target to work towards/ a deadline like in the real comics world. If the story is just the Hellboy portal idea, can we get started whenever we want? or is there a basic plot/script coming? As long as everyone understands the basic premise so all the stories flow together (HB exits a portal, and re-enters at the end) then i say yeah, people get started. Id say for an end date..:lets figure last day of February to try and have it wrapped up. Nerd question: What kind of portal? A disc, bubble, doorway...? Does it matter? It does abit, have some consistency in the pages. So ive envisioned it as a somewhat circular portal like a swirling vortex in the center sucking him in. Ever see “monster squad”? At the end? Monster Squad....watched it two days ago, for the first time. Written by Shane Black ! It is also similar to the portal in Evil Dead 2. Did some sketches in my lunch break, The first hellboy from memory looked 'off'.... looked on the net and saw he has no eyeballs. Just posting to keep myself motivated. 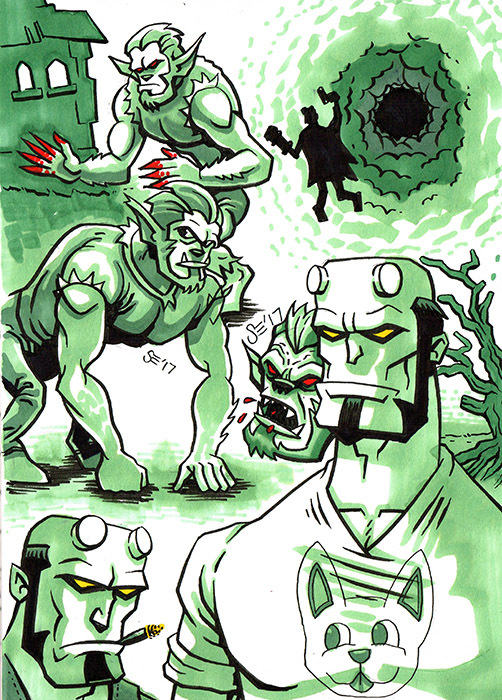 And yes, my pages will be Hellboy vs a Werewolf. Baxter building. Hellboy falls out of a portal inside the Baxter building... drops his cigar, The Thing picks it up, asks Hellboy; "need a light?" 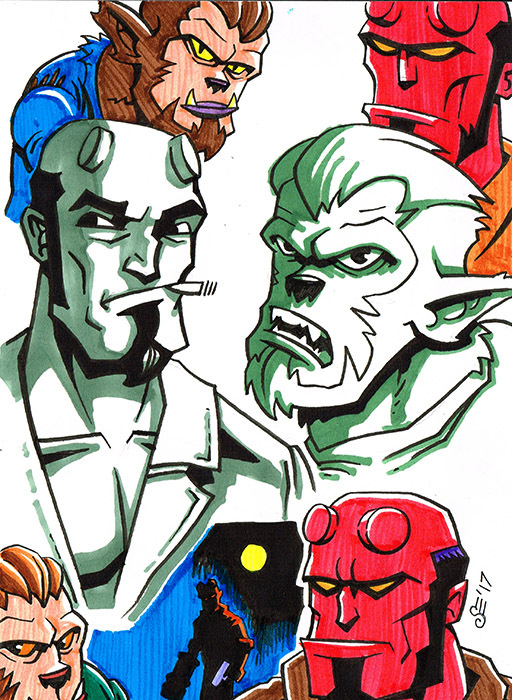 lights the cigar with his own cigar, portal opens... Hellboy says; "Mighty kind of you gruesome." enters into the portal on another wall ... The other Fantastic Four appear as Hellboy disappears, Reed asks Ben; "who was that...?" The Thing shrugs, "no idea, but I like his style." Aiming for about 3-4 pages I think. love the colors. so good.